The Mac is - and has always been - built around mouse actions and drag-and-drop. Even today, Mac OS X arguably beats the competition when it comes to transferring chunks of content between apps, just by dragging selections. However, although Finder makes drag-and-drop file transfers simple, third-party applications can further enhance the process, enabling you to more rapidly move files locally, or, in some cases, even upload them to online services. Aptonic's Leopard-only newcomer Dropzone calls itself the 'Swiss army knife of drag and drop', and it's easy to see why. Drag an item to its Dock icon to view a stack-like grid of user-definable locations. On dropping your item, it can be sent to a local folder, an FTP location, Flickr, Mail, TwitPic, and several other places. Like Dropzone, Dragster is a Dock-based app that enables you to send a dragged item to local and remote locations, or an email client. Rather than pre-configuring items, its workflow is based around remembering previous locations. While Dropzone wins out on Leopard, Dragster is suitable for Tiger uses. Quicksilver is a long-time Mac favourite enables you to drag an item to it and perform all manner of actions via a unique three-pane interface. The default install enables files to be moved and copied locally, and plug-ins provide further functionality, such as integration with the Transmit FTP client. Although initially a launcher, LaunchBar is now a fully-fledged productivity utility. Drop an item on to its Dock icon and you can perform various actions on it via a click of a mouse or a keystroke - and like Quicksilver and Spotlight, sends and copies are sped up due to LaunchBar's incremental search. 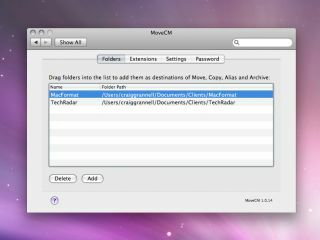 Finally, MoveCM takes a more mouse-centric approach, adding 'move', 'copy', 'archive to' and 'alias to' actions to Finder's contextual menu. Sub-menu locations for each action are defined via MoveCM's System Preferences pane.